With holiday travel season looming and airline companies increasingly trying to squeeze every last dollar out of passengers, surely there's a way to make flying at least somewhat more bearable? If you can't afford a business class upgrade (because really, who can) and aren't holding out hope for a high-speed rail system, you can — and should — make the most of the one crumb of control left to you: your choice of seat. Per a recently-updated SmarterTravel piece on "The One Seat You Need To Avoid on a Plane", it turns out the "worst" seat on any given flight is basically all of them. 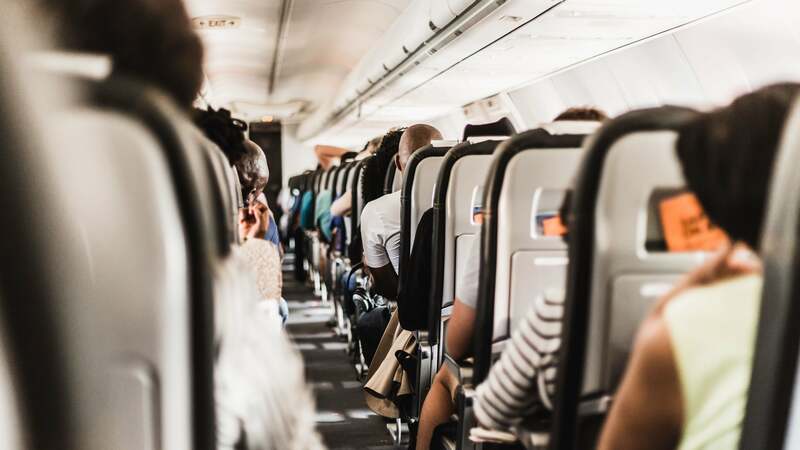 Most frequent flyers are well-acquainted with the trade-offs of the bulkhead and exit row seats: More legroom, yes, but also a bulkier armrest and nowhere to leave your things within easy reach. There are some hazards, however, that are a little more insidious. According to SmarterTravel, one seat on the plane is blessed with the entertainment box taking up the entire area under the seat in front of them, which you have no real way to plan for on the seat selection map. "If you like the feeling of a little room, it can be nice (and it's a perk to be able to stash your stuff alongside you rather than under the seat in front). But beware: The person in the seat behind you may claim this space as their extra legroom, which could mean enduring malodorous feet wiggling in your peripheral vision for the length of your flight. And believe us when we say this can make any flight smell twice as long." Section changes are generally dubious for seat comfort. In front of the exit row and you won't be able to recline; between different-length rows, your leg room may be taken up by the anchors of the seat in front of you. Back-of-section seats most likely won't recline but you also won't have a child behind you kicking you every five minutes. And of course, the double-edged sword of bathroom proximity. Sticking to the middles (though certainly not the middle seat) seems to be the safest bet. So what's a plebeian coach traveller to do? Try a site like SeatGuru or SkyTrax to check out the map beforehand and cross your fingers. It also doesn't hurt to recheck the seat map when you check in online just in case a better seat opened up at the last minute. My take-away from having to do a fair number of long-haul flights between the US and Australia recently, in economy class because I'm not rich enough to pay double is that for international flights, the extra $50 or so for a premium economy upgrade is worth it. The extra legroom they offer sounds like a small amount, but it's quite a bit in practical terms. Additionally my approach has always been to try and get an aisle seat in the middle section of any plane that has three seating sections in economy. Having the aisle means you can basically stonewall and force the person in the middle seat to bother the other side, but you can also get up whenever you want without bothering anyone. 3-4 rows back from the end of a section is also better. The exit rows are often taken by people traveling with small children so they can attach a crib to the wall. I'm very sympathetic to parents traveling with infants, there's not a lot they can do, but at the same time I'd rather not be too close to a crying baby.